Justin Chenette poses outside the Journal Tribune. A Maine Examiner report shows Chenette gave the paper more than $4,500 in taxpayer funds for advertising for his Senate campaign in 2016. Chenette also sells advertising for the paper. 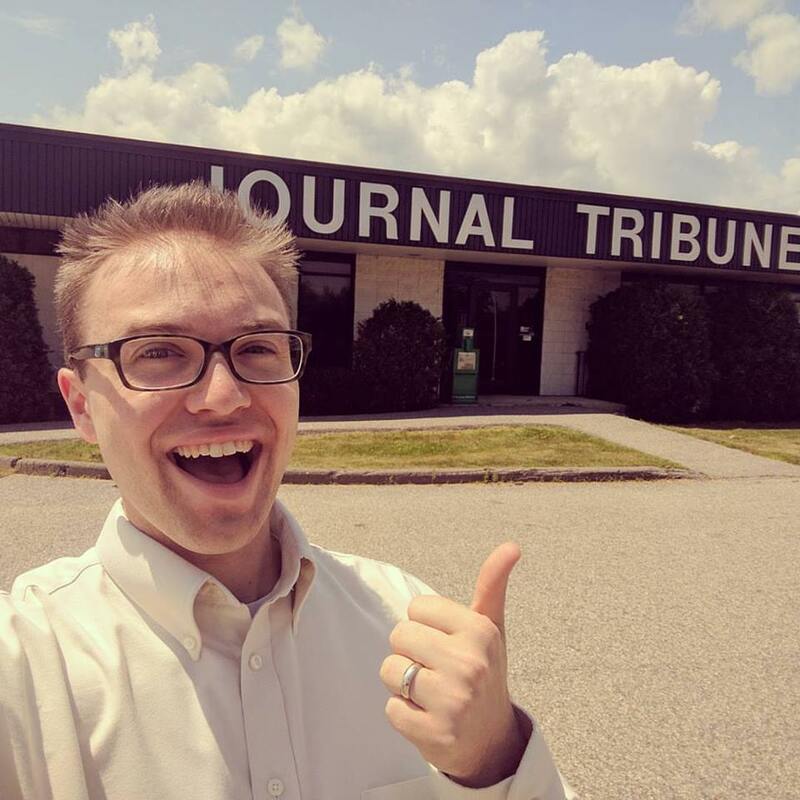 The Journal Tribune did not respond to questions about the nature of the advertising or if Chenette was paid a commission for the advertising he appears to have sold to himself. Photo courtesy Justin Chenette’s Facebook page. SACO – Senator Justin Chenette of Saco is fond of making statements about fighting the influence of money in politics or speaking about the improper use of money in Maine elections, but documents reviewed by Maine Examiner raise questions about Chenette’s use of taxpayer money for his campaign and the possibility of unethical personal benefits Chenette may have received from his use of taxpayer funds for his State Senate campaign. Chenette, a first term Democrat Senator, is known for emphatic speeches framing himself as the virtuous watchdog over the interests of the people of Maine and appearing ready to fight any battle that can draw attention to issues of campaign finance, and as a result, to himself. But documents reviewed by Maine Examiner show that in the 2016 campaign cycle, Chenette used taxpayer funds to purchase advertising from his private sector employer, the Journal Tribune, to support his own candidacy for Maine Senate. The transactions, discovered in filings with the Maine Ethics Commission, show Chenette purchasing nearly $4,500 in advertising from the Journal Tribune, which bills itself as York County’s only daily newspaper. Chenette is the sole Digital Advertising Executive for the paper and has promoted himself as being available to sell customers print, digital and other services at the paper on his personal Facebook page. Recent online job postings indicate that advertising jobs such as Chenette’s at the Journal Tribune are paid a commission on sales. In total, Chenette spent more than $42,000 in taxpayer funding on his campaign, returning $17.34 in unspent funds to the MCEA fund on November 28, 2016, according to reports available from the Maine Ethics Commission. The Journal Tribune did not respond to an inquiry about the details of Chenette’s taxpayer funded advertising or any commissions Chenette was paid for “selling” advertising to his Senate campaign as a Journal Tribune representative. Sources speaking on condition of anonymity have indicated they are aware of Chenette profiting from the sale of ads to his own campaign. Maine Examiner waited three days for an official response before publishing this story. A review of state laws and ethics guidance for the use of taxpayer money on political campaigns provides instruction to candidates using taxpayer money on avoiding personal benefit from the use of public funds in some cases, but does not appear to specifically address the potential of a candidate being paid a commission for buying advertising from themself at their sales job. The guidance also does not specifically address the scenario of a candidate paying their employer with taxpayer money unless they are a sole proprietor or top executive of that company.